MPAC Calls Me an "Expert on Islam"
Why thank you, Muslim Public Affairs Council, for this endorsement. 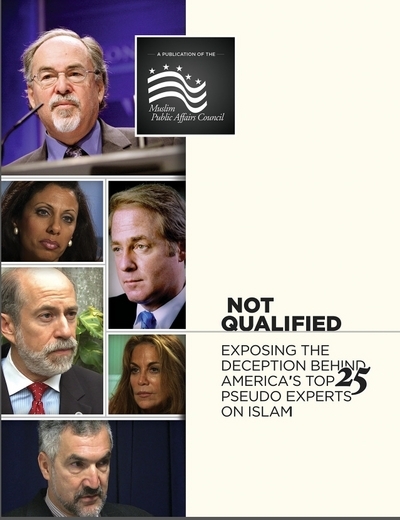 It's much appreciated, even if came in a 65-page pamphlet, Not Qualified: Exposing the Deception Behind America's 25 Top Pseudo-Experts on Islam. According to MPAC, a leading Islamist group based in Los Angeles, those 25 would be Andrew Bostom, William Boykin, Stephen Coughlin, Nonie Darwish, Steven Emerson, Brigitte Gabriel, Frank Gaffney, David Gaubatz, William Gawthrop, Pamela Geller, John Giduck, Sebastian Gorka, John Guandolo, Tawfik Hamid, David Horowitz, Raymond Ibrahim, Zuhdi Jasser, Andrew McCarthy, Walid Phares, Patrick Poole, Walid Shoebat, Robert Spencer, Erick Stakelback, David Yerushalmi … and me. [A]n individual who has formal academic qualifications in Islamic Studies from an accredited institute of higher education in the West or those institutes of higher education in Muslim-majority countries that rank among the world's top 500 universities. In order to be classified as "expert", as defined above, one's credentials must also be publicly verifiable. According to MPAC, "Of the 25 people examined, only 1 (4%) had the qualifications to be considered an 'expert' on Islam." That 4% would be me. In another place, MPAC contradicts itself and allows that Raymond Ibrahim also has "the formal and verifiable academic credentials to be classified as an expert." Even more contradictorily, as the pamphlet title implies, MPAC says I am a "pseudo-expert" expert on Islam. 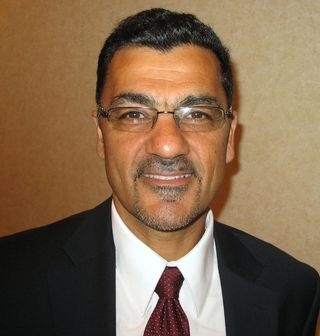 My first question is, why does MPAC choose individuals who make no claim to expertise in Islam (such as John Giduck and David Horowitz), but exclude critics with academic credentials in Islamic studies, such as Fouad Ajami, David Cook, David Forte, Efraim Karsh, Martin Kramer, Bernard Lewis, Michael Rubin, Philip Salzman, and Kemal Silay? My main objection is to the emphasis on credentials. The field of Middle East studies demonstrates only too-colorfully that possessing a PhD does not guarantee competence. Sadly, it's almost the opposite. It's not where a person went to school in his twenties, the languages he knows, or his years living abroad that matters but the capabilities, knowledge, energy, and intelligence he subsequently displays. Speaking as someone who has the requisite degrees, languages, and years abroad, I despise this self-serving emphasis on academic pedigree which would exclude non-PhDs from commenting on things Muslim. MPAC's Salam al-Marayati, out of a job? A number of individuals on the MPAC list of 24 have made real contributions. Take the example of Robert Spencer: he has a mere M.A. in religious studies, lacks fluency in Middle Eastern languages, and has not lived in a Muslim-majority country, to be sure, but he has developed a deep erudition on Islam demonstrated in his many books. Indeed, I challenge MPAC to put him toe-to-toe with any PhD'd expert on Islam of its choosing. I nominate that foremost credentialist, John Esposito, for the job. As for MPAC's charges against me: to begin with, I never present myself as an "expert on Islam" but as a specialist on Muslim history and politics. There's a huge difference. I study not the Koran but Muslim actions. MPAC writes that "there is no record of him having traveled to a Muslim-majority country for original research in several decades": First, how does MPAC know my travel schedule and whether or not I do original research during my trips abroad? My travels are private. Second, since when do historians do fieldwork? My three-plus years in Niger, Mali, Tunisia, Egypt, and Turkey in the 1970s taught me a great deal but they had no bearing on my historical work, which focused on the early medieval period. Third, Islam in the United States is the topic common to MPAC and the 25, including me; living in Philadelphia, therefore, I do fieldwork every day. 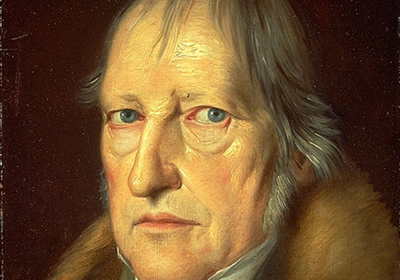 German philosopher Georg Hegel (1770–1831). MPAC impugns me for not seeing Islam as a religion of peace: But this "religion of peace" claim is a farce, as ridiculous as saying that all Muslims are violent. Any historian worth his salt knows that warfare has characterized Muslim history at every turn, from the seventh century. As the German philosopher Georg Hegel put it, Muslim kingdoms and dynasties are a "boundless sea" on which "there is a continual onward movement; nothing abides firm." MPAC criticizes my citing Hisham Kabbani and Michael Waller as sources of information: Kabbani gave valuable first-hand testimony about the radicalization of American mosques and for this, in a revealing act of Islamist arrogance, was hounded out of the Islamic establishment. Research published in 2011 by Mordechai Kedar and David Yerushalmi, by the way, confirms Kabbani's estimate. As for Waller, I quoted his Senate testimony about the percent of mosques in the United States owned by the North American Islamic Trust; he is a credible source – as his Senate appearance suggests – and his estimate of mosque ownership stands unchallenged. How these citations impugn my scholarship baffles me. MPAC recalls that my nomination to the board of the U.S. Institute of Peace in 2003 ran into opposition in the Senate: That some Democratic politicians did not like my views invalidates my scholarship? Give me a break. MPAC takes offense at my saying that the internment of Japanese-Americans in World War II was justified: Agree or disagree with this opinion, it has zero bearing on my knowledge of Muslim history. So, MPAC, thanks again for deeming me an expert on Islam. Sorry your efforts to undo this proved so lame. Mr. Pipes (www.DanielPipes.org) is president of the Middle East Forum. Related Topics: Middle East studies, Muslims in the United States | Daniel Pipes receive the latest by email: subscribe to the free mef mailing list This text may be reposted or forwarded so long as it is presented as an integral whole with complete and accurate information provided about its author, date, place of publication, and original URL.